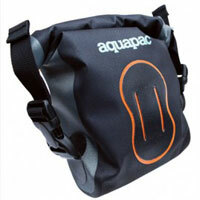 Aquapac's camera pouch is a waterproof bag for cameras based on the 'roll-seal bag principal'. The camera sits inside a separate, padded pocket (which a little surprisingly doesn't close); this is located inside the waterproof outer bag, the top of which is rolled down three times and then secured at each side by two buckle fastenings. I tried out the small size (on recent walking trips in the East Riding of Yorkshire and then a very wet Cheshire) with a standard 'point & click' digital camera, a Canon A3100IS. There was plenty of room for the camera plus my iPhone. I had previously tried out the pouch at home stuffed with newspaper and showered it very, very liberally before floating it in the bath! There had been no trace of water ingress ... so I was confident enough to use it for real with my camera and phone in some extremely heavy Cheshire rain. I wore it around my waist and found it really very comfortable .... it's lightweight and it certainly did keep out the rain. It's necessary to take your camera out of the pouch to use - and of course, that is a drawback if it is raining. I think the outer, waterproof bag could be used on its own as waterproofing for less fragile items. A very minor criticism is that some partitioning in the cell would be handy - to keep tidy a spare memory card or batteries. If you're an all-weather walker (who occasionally falls in the odd stream) then consider Aquapac's waterproof pouch - to keep dry your irreplaceable photos and/or your expensive-to-replace camera.